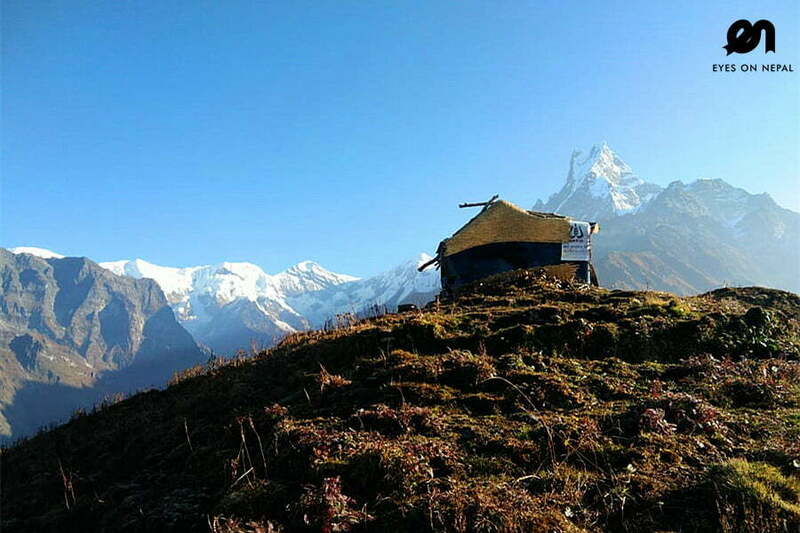 Mardi Himal Trek goes around the vicinity of Macchapuchre or Mt. Fishtail. Being a newly opened trail, very few tourists have trekked in this area. 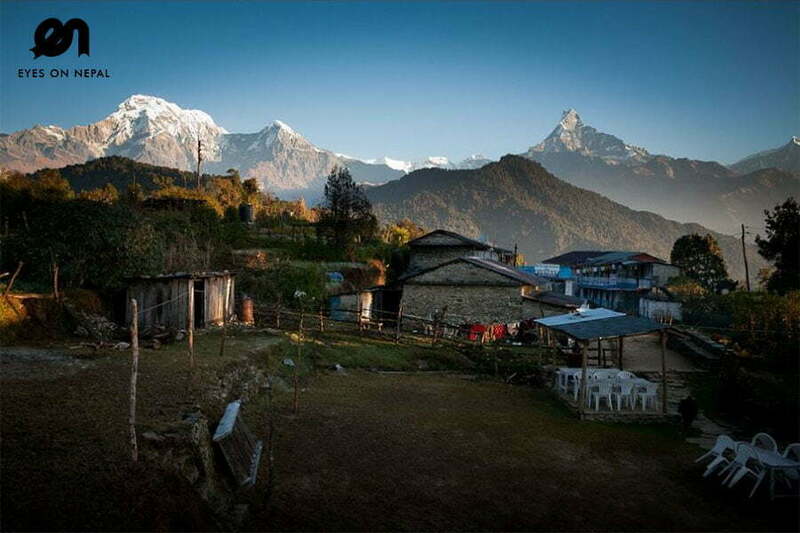 Mardi Himal trek features beautiful villages which are typically Nepali in style and architecture. Besides you will also experience wildlife and panoramic views of the most beautiful mountains including Annapurna South, Mount Machhapuchhre (also known as Fishtail) and Mount Hiunchuli. 09.30am: Arrive in Dhital. An old village in this area. 12.30pm: We arrive in Dhampus. We will have the lunch with good mountains views in Dhapus which is known as one the most photogenic village in the region.. Highlights: Views of snow-peaked mountains and walking though jungles and Rhododendron and pine forest. 07.00am Breakfast at your hotel. 09.00am Start your trek to Forest Camp. 11.00am Arrive in Pritam Deurali(2300m) and have your packed lunch here. NOTE: There are no tea houses for lunch between Pitam Deurali to Forest Camp. 12.00pm Start your trek to Forest Camp after the lunch. 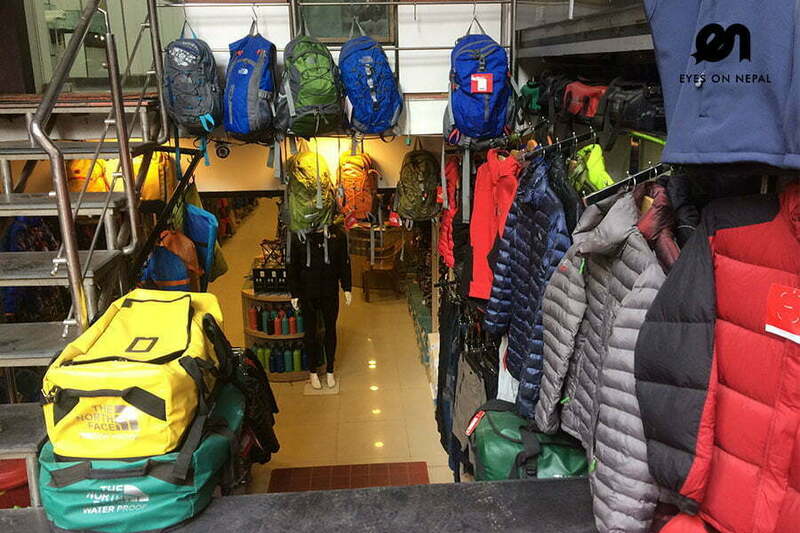 NOTE: While you will head toward Forest Camp, you will be at the main trail going to Annapurna Base Camp and start uphill trekking in the deep Rhododendron and pine forest. 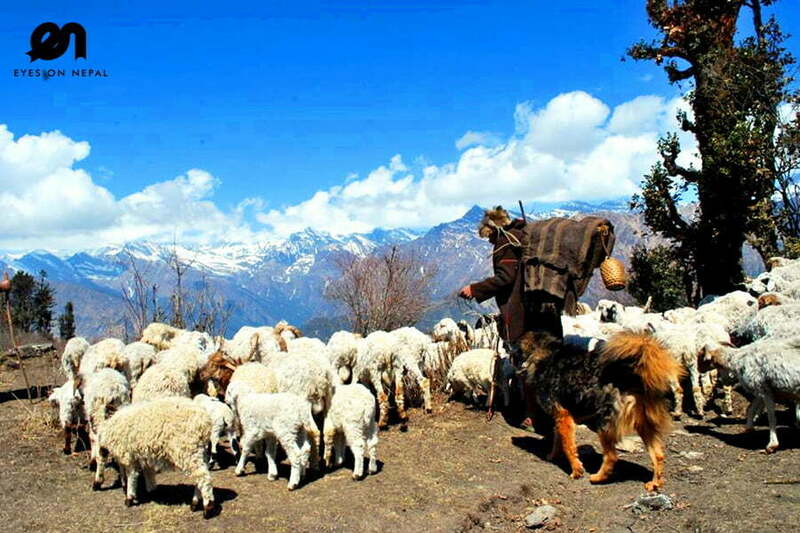 There is no permanent trail from Pitam Deurali to Forest Camp because this trail used to be the shepherds’ trail to bring their cattle to higher pastures during summer. Please be aware of several trails that lead to neighboring villages such as Tolka, Landruk, Lwang and Siding Village. Please carry enough water for the next 4 hours because you won’t find any water sources between Deurali and Forest Camp. 03.00pm: Arrive at Forest Camp. you will overnight in one of the 3 lodges availalble in the Forest Camp. NOTE: Forest Camp is located in the middle of Rhododendron and pine forest. 03.30pm: Check in hotel. Rest & relax. Dinner at hotel. 08.00am: Start your trek to Rest Camp. NOTE: This place was named Rest Camp because of the challenging uphill trail. Trekkers can have rest on the way to High Camp at Rest Camp. So is named – Rest Camp. You can see some glimpse of Fishtail Peak and Annapurna III and IV. 09.00am: Arrive in Rest Camp and continue the uphill trek to Low Camp. 10.30am: Arrive in Low Camp (2970 m). Continue the trek to High Camp. 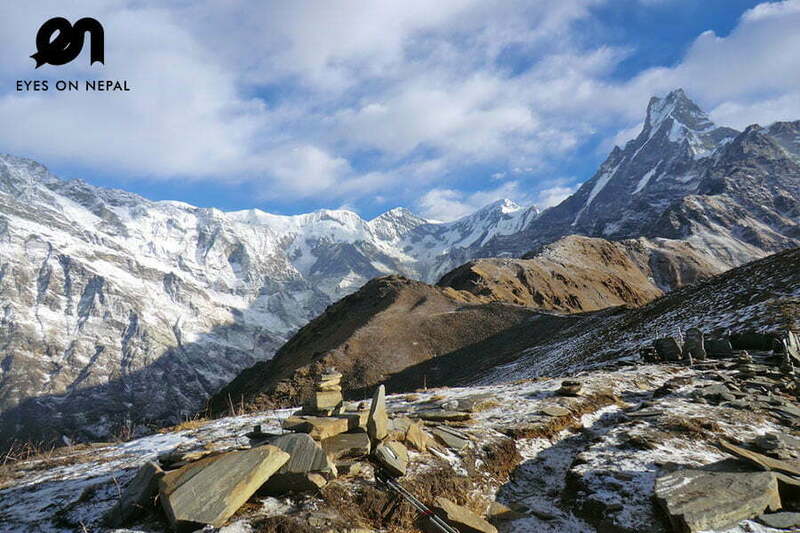 On the way you will see the himalayas mountains such as Annapurna South, Fishtail and Hiunchuli. 12.00pm: Arrive in Badal Danda. Have your lunch here. NOTE: Badal danda is above the tree line (above the cloud) on clear days. You can see amazing views of Fishtail, Mardi Himal and Annapurna South, Ghorepani top and Pokhara Valley can be seen clearly from here. If you are staying at Badal Danda, you can see the amazing views of sunset and sunrise. Please make your hotel’s reservation as early as possible because there is only one hotel at this area. 01.00pm: Continue the trek after the lunch to High Camp. 03.30pm Arrive in High Camp. Check in hotel/lodge. NOTE: Dinner will be prepared at the hotel/lodge. 05.30am: Wake up and have your tea at the lodge/hotel. 06.00am: Please take your packed breakfast and start uphill trek to Mardi Himal Base Camp. NOTE: It is uphill trek. 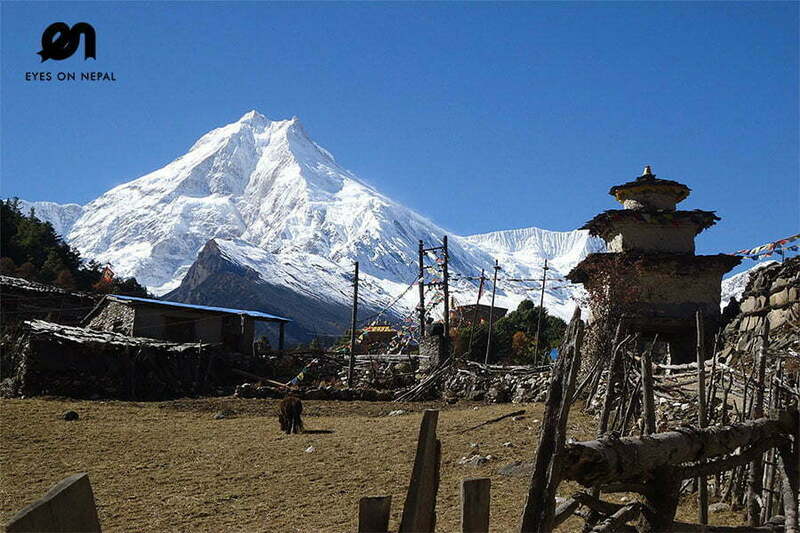 On the way you will see the close view of Annapurna South and Fishtail. 09.30am: Arrive in Mardi Himal Base Camp. 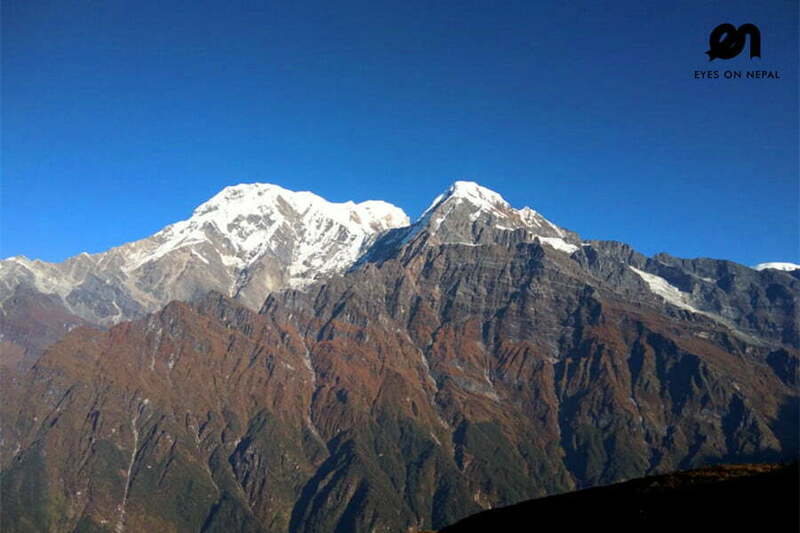 Feel the altitude and enjoy the close view of Mardi Himal Peak. 10.30am: Our mission is over. Continue the downhill trek to High Camp. 12.00am: Arrive in lodge/hotel at High Camp. Have your lunch before heading to low camp. 03.00pm: Arrive in Low Camp. Overnight at local lodge in Low Camp. Dinner at the lodge. 07.00am: Wake up and breakfast at the lodge. 08.00am: Start downhill trek to Siding Village(1885m). NOTE: Siding has small bus station. If you not like to continue the trek , you can take bus or Jeep to Pokhara. NOTE: It is 3 hours drive. 11.00am: Arrive at Siding Bazar. Have your lunch at local restaurant. 12.00am: Continue the trek to Lwang village. 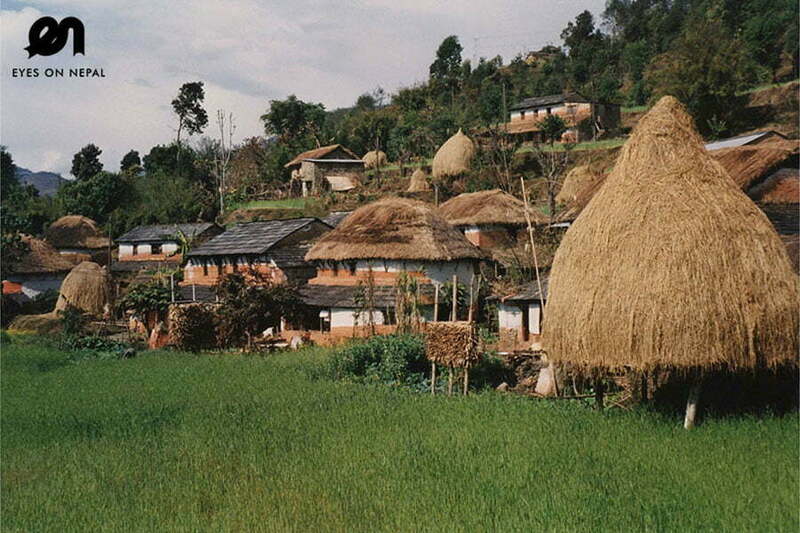 Lwang is the Gurung Village with rich culture and tradition. You will not only see it but can feel it too. 03.30pm: Arrive Lwang Ghalel Village(1600m). You will have a good opportunity to experience the cultural and tradition of Gurung Clan. Overnight at home stay with the locals. NOTE: You will stay and eat at a local house with locals. They will make traditional Nepali meal call Dhal Bhat (Lentils, Rice, Seasonal Vegetable with fresh organic ingredients). Enjoy the meal and with local chicken curry. A local cultural dance program can be organized for a small fee. On your free and easy time you can explore village till dark. 07.00am: Wake and breakfast at the lodge. 08.00am: Start downhill trek to Astham Village. 11.00am: Arrive in Astham Village. Have your lunch here. 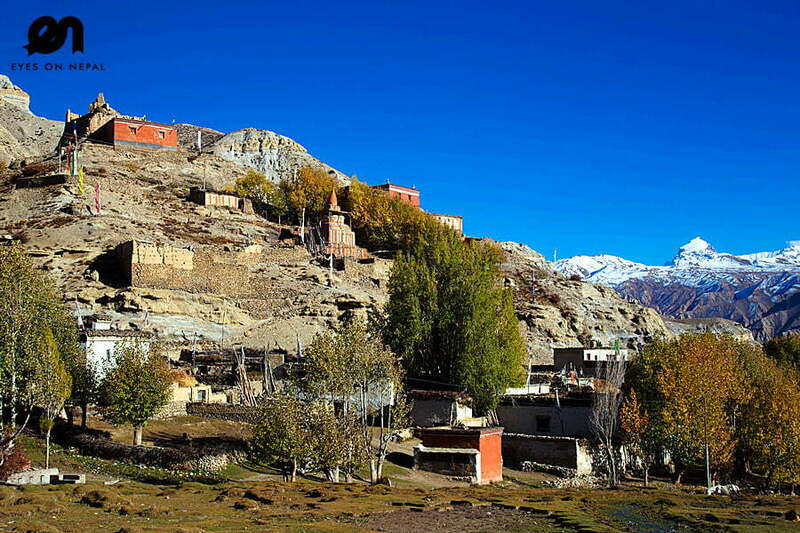 NOTE: On the way to Astham, you have a good opportunity to observe the local culture and tradition. You might not get this opportunity in other trekking route. 12.00am: Continue the trek to Milan Chowk. 01.00pm: Arrive in Milan Chowk and visit the Tibeten Monastery on Hyanja. 03.00pm: Drive to Pokhara after visiting the monastery. 03.30pm: Arrive in Pokhara. Check in your hotel. Congratulation your trekking ends. Accommodations x 5 nights in the mountains. NOTE: Base on twin sharing. Pick up from trekking ending point and transfer you to Pokhara. All necessary paper works, conservation entry permits and Trekkers’ Information Management System (TIMS) Permit. .
Any extra expenses due to weather change or natural causes such as landslide or accident.